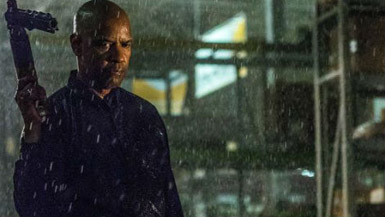 The Equalizer probably would have been a better movie had it told us more about who the title character is rather than show us what he does. We know going in, just as the story suggests early on, that Robert McCall (Denzel Washington) has a complicated past, one that he’s not particularly proud of. Nowadays, he’s an austere yet gentle man who rises early, clocks in and out of his job at a Home Depot-like store, and waits until dark to go to a small, unassuming diner in Boston, where he brings his own tea bag, methodically arranges the silverware, and then quietly reads a book off the “100 Books Everyone Should Read” list, all by himself. This is Robert’s day. It’s just like the one before and no doubt the one after. Only later do we learn his routine is his way of keeping himself in check. But then a wrench enters the mix in the form of an adolescent call girl who goes by the name of Teri (Chloë Grace Moretz). She’s Russian and works against her will for the sleazy Slavi (David Meunier), a pimp whose organization has ties to the Russian mafia. Robert befriends Teri at the diner and when he sees she’s suffering from both emotional and physical abuse at the hands of her employer, he tries to buy her freedom. After Slavi and his goons decline his offer, we see what Robert can really do, which is to utilize everything around him to kill with absolute precision and without mercy. He’s so obsessed with accuracy and perfection, he even times himself. Before long, Robert is in an all-out war with the Russian mafia, as well as a group of dirty Boston cops. Leading the fight for the Russians is the equally ruthless Teddy (Marton Csokas), “a sociopath with a business card” who’s been sent by the big cheese to see that Robert gets what’s coming to him. This is the basic setup for The Equalizer, and for its first half, it’s a patient, interesting and surprisingly restrained film. Richard Wenk’s screenplay, based on the 1980s television series, begins as a character study and although we know there will be the inevitable scenes of gritty violence and sensationalism, we were hoping these wouldn’t completely take over, or if they did, they’d at least be credible.